Tomaquag Educator Lynsea Montanari with a group of children during a storytelling program at Tomaquag Museum. Summer is over and it’s back to school time! Imagine a school with no doors, no desks, and no paper or pencils. Your classroom is the great outdoors, your learning tools must all be made by your own hands, and your teacher is a loving and trusted relative. Hands-on, holistic learning in a safe and loving environment was key to a child’s education in Indigenous communities and is still employed in the homes of many Indigenous peoples today. 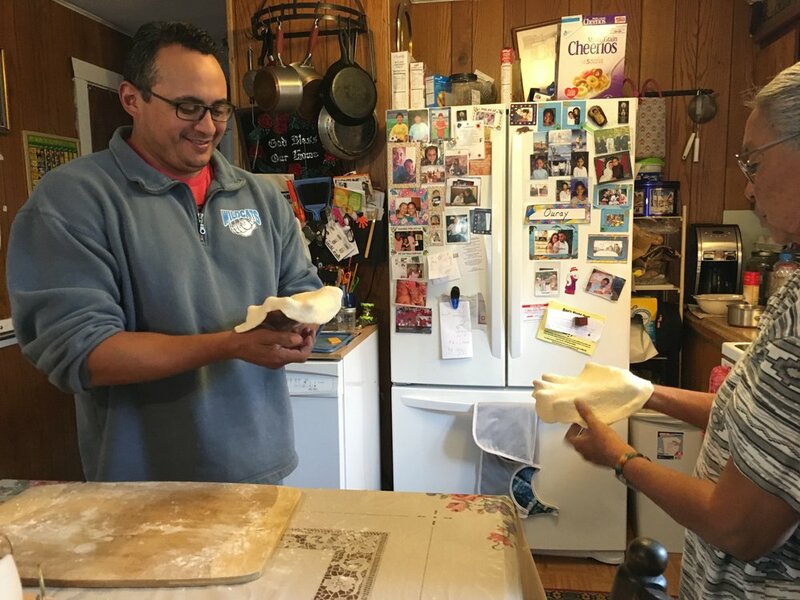 Tomaquag's Marketing Associate, Quanah LaRose learning how to make Frybread from his mother. The best way to learn anything is to find yourself knee-deep in it with no other option than to find a way to make it work. From an early age, children are encouraged to get involved, try things out, and work side by side with their elders to develop and hone their skills. Most often a child’s teacher would be a close relative like an aunt or uncle, but not a parent. There was an understanding that emotions can run high between parents and their children and this sometimes interferes with the learning process. A close relative will still be fully invested in the child’s education but will have more control to separate emotion from instruction. This provided a safe, loving, and stable learning environment. Now the first step to learning is to look and listen. Even today in Indigenous communities, if there is something we want to learn we are simply told to watch. Whether it’s beading, cooking, basketmaking, or traditional dance, a student is instructed to sit quietly, look, listen and learn. With no books to refer to and no written instructions to follow, this type of instruction allowed the pupil to formulate their own ideas and methods that would work best for their own unique abilities. Even though asking questions is important to exploring and engaging in learning, there is a lot that can be learned from simply listening. Storytelling not only provided entertainment in Indigenous communities, it was also an important education tool. Stories can relay the values and traditions of a community in an unobtrusive way, allowing the listener to interpret for themselves the lessons to be learned. In this way the belief systems of a people can be passed on from generation to generation allowing for adaptations that can relate to the changes in time while preserving the traditions of past generations. Though the words may not be written on paper like today’s textbooks, traditional stories can still teach us more than we can imagine! Traditional games, like storytelling, were not only a fun pastime. They were well adapted modifications of tasks essential to survival. Traditional games helped the player build the skills necessary for adulthood. Concentration, attention to detail, a steady hand, and of course perseverance could be matured through steady engagement in fun and active gameplay. Healthy camaraderie and a well developed sense of community is nurtured through competitive and team sports like Stickball, double ball, hubbub, and a game similar to football called “Pasuckquakowauog” which basically means village against village. In a harsh environment, community is vital to survival. When a whole team is working toward the same goal, you have a greater chance of success. The same is true in learning. When all the students encourage and support one another, you have a greater chance of everyone’s success and no one is left behind. As you prepare for the school year with back to school shopping, think about this…For young Indigenous people who wanted to learn skills like pottery, basketry, gardening, fishing or hunting, the first step was to learn to make your own tools. There was no Walmart to stock up on supplies. Making the tools necessary for a task was the first step in learning that task and your performance in a task is only as good as the tools employed. Therefore, as you progressed in the art of tool making, so would you progress in the activity. The two were intrinsically tied together and therefore to excel in one you would have to learn to excel in both, thereby becoming a master in the craft. So this year, think about becoming a master of your own education and engage as much as possible in the process of learning! From the Tomaquag Museum, we wish you all a great and exciting school year! Peesh’KuNash Netompaûog (See You Later Friends)! 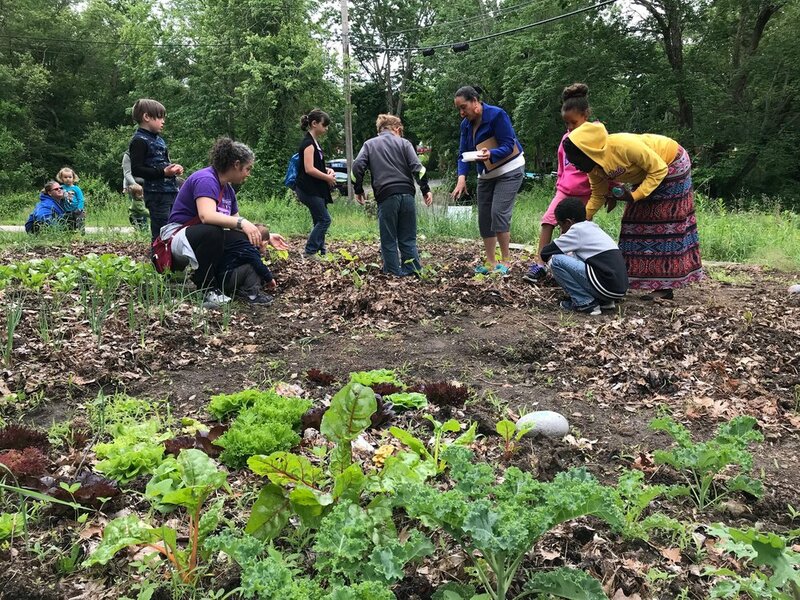 A group of children and their parents working together in Tomaquag's garden during Children's Hour.